March. I thought I would be shedding my winter jacket, but lo and behold, we got some stormy weather in Annapolis. We had a “snow day” for rain. The kids were off of school in anticipation for snow but no luck. This never happened growing up in Pittsburgh. I remember going to school in 12 ft of snow. Well, maybe that’s a tall tale, but I don’t ever remember snow days for just rain. Crazy pants. At least I got a workout in before the weather got ugly. I went to a spin class and got out craving my favorite post-workout drink. and protein to repair and build muscles? . 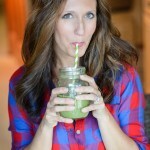 This smoothie helps you do that and more since it is plant-based and easy on the digestive system. It also aids recovery which is the most important. Without proper recovery for your cells, you are more prone to fatigue and injury. Directions: Blend all ingredients in the Vitamix (or any blender). Pour into your glass and drink up. *Note: Put your banana in the freezer overnight for a frostier smoothie. *I use the Blender Bottle to store my smoothies especially if I make it the night before. Saves so much time that way. *Instead of the Vega, you can use Amazing Greens or bypass the powder with Bob’s Red Mill GF Rolled Oats. Do you have a go-to after workout meal? Share! I’m always amazed at all the cool ideas in the comments. I just made this right in this minute! YUM! I admit I have never splurged on the Vega powder but I did today! 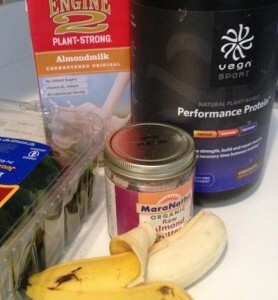 The Vega is so worth it…I actually make this after an intense workout that lasts an hour or even more. Not everyday thing. 🙂 So glad you are diggin’ the smoothie, sweet Dana!